November 2011 - Contemporary Controls will be exhibiting at the SPS/IPC/DRIVES fair in Nuremberg, Germany, November 22 – 24, 2011. The show promises to be the largest SPS show to date. Almost 1,400 exhibitors are expected to attend, providing the most comprehensive overview of electric automation related products for the European audience. The SPS show remains one of the largest of its kind in Europe for the electric automation industry. The exhibits encompass the entire market, from the individual components to complete systems integrations. "The SPS show is a great opportunity for us to see our European customers and understand their latest product needs," said Paul French, EMEA Sales Manager of Contemporary Controls. 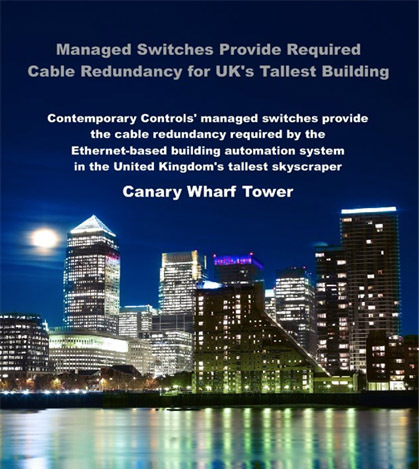 "We'll have our CTRLink product line on display, including the EICP8M, which provides the cable redundancy required by UK's tallest skyscraper – Canary Wharf Tower." One Canada Square, more commonly called Canary Wharf Tower is the tallest building in the United Kingdom, measuring 236 meters. The EICP8M managed switch was installed to provide the required cable redundancy using RapidRing, a proprietary ring network technology from Contemporary Controls that can provide recovery within 300 ms.
addresses the needs of the automation professional. Unlike office-grade products, all CTRLink product enclosures are metal and intended for direct panel or DIN-rail mounting. Metal DIN-rail clips prevent damage during installation. All products can share with other automation equipment a common 24 VAC/VDC power source, eliminating the need for a dedicated mains-powered transformer. Most models have provisions for redundant power sources to accommodate back-up strategies in critical applications. Depending on the application, Ethernet performance needs can vary greatly. For simple systems, CTRLink plug-and-play (unmanaged) Ethernet switches will suffice. These products will operate "right out of the box" and can be put into service without adjustments. Models are available with either multimode (MM) or single-mode (SM) fiber optic ports to accommodate long distances through hostile environments. If no fiber optic ports are available on equipment to be connected, a CTRLink media converter will do the trick. Plug-and-play switches provide a simple, cost-effective method of expanding Ethernet networks. A unique 5-port unmanaged switch is the diagnostic switch which never learns MAC addresses and therefore floods traffic to all ports. This feature is ideal for network troubleshooting because all network traffic can be observed from any port. More demanding applications require managed switches that support the SNMP protocol – providing data on network health and the ability to report abnormal operation. Managed Ethernet switches provide the ultimate in network performance. While Ethernet switches can expand a single Ethernet network, Contemporary Controls IP routers connect two Internet Protocol (IP) networks together – passing appropriate traffic while blocking all other traffic. With automation systems, applications vary – possibly requiring a special product or need. Contemporary Controls has worked with OEMs in obtaining UL 864 compliance with some CTRLink switches, and can help in other areas such as private-labeling, unique packaging or extreme environmental design. Whatever the Ethernet infrastructure need, a solution is available with CTRLink. Visit us at booth 10-141 to learn more.